Today was one of those occasional beautiful winter days here on the coast. The sun came out, there was hardly a breeze, and it was even sorta warm in the sunshine. I got to paint blue into the ocean color for a change. Not only that, this is officially Wave Study #19! Yes, I am back to plein air wave studies. My week or so spent painting finished paintings from my wave studies has improved my understanding of the process and my plein air paintings took a turn toward a great improvement. I was so happy to be back out. I got a tad chilly but it was such a pleasure to see the different colors for a change. The smudge on the upper left corner of the picture is a shadow from the canvas holder on my pochade box. The light was fading fast and I wanted to get a picture in natural light. I didn't quite have the time to set it up differently. I do see plenty of areas I would like to improve but overall, I am quite pleased with this plein air wave study at this stage of my learning. The sun was in my eyes toward the end which made it more difficult to see my canvas and judge the painting accurately. I did use my umbrella but at that angle, the sun is challenging. I am also pleased with the new canvas I am using for the studies. I ordered 12"x16" pads of primed cotton canvas from Utrecht. I can get 4-6"x8" canvases out of one sheet and there are 10 sheets in a pad. I think the cost came to about 50 cents a painting. Most economical for practice. 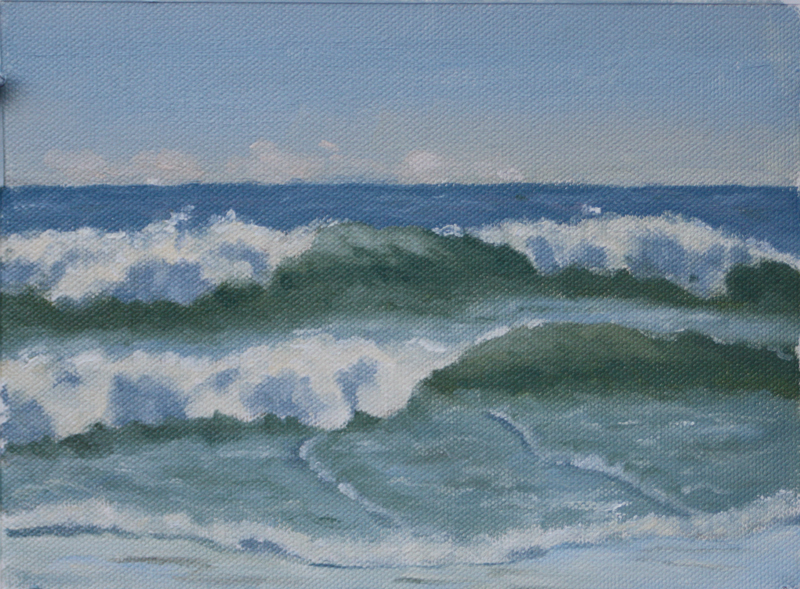 The wave studies are not for sale but the paintings I make from them are. They are currently on my DailyPaintworks site which can be reached by clicking on the badge on the side bar. I am currently working on redoing my website and blog to make it easier to buy a painting. I must mention, the paintings I have for sale so far are painted on linen canvas mounted on birch panels. Much higher quality. Well, I must get dinner on the table. It feels great to get back out to the beach. Oh, I love it when you put new daily paintings up! You are going to spoil us all in this month. Love the wave structures you captured on this and the color differences. Your water has a lot of depth in this painting. Thank you Theresa! In spite of the strain, I am having a good time and learning a lot.While I probably won't be painting seven days a week, my output should be a lot higher after this month. I will be good to have time to study too.